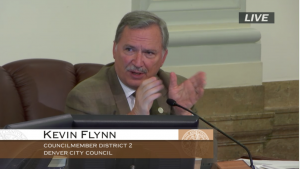 Kevin Flynn announced that he is a candidate for re-election to the Denver City Council’s District 2 seat in southwest Denver. The election is May 7, 2019. Kevin was elected to a first term in June 2015. He is running on a record of accomplishments that include reducing police response time to emergency calls, increasing community involvement by establishing new registered neighborhood organizations in areas that had none, and improving quality of life in the district through stepped-up neighborhood inspections, speeding enforcement and pedestrian safety. 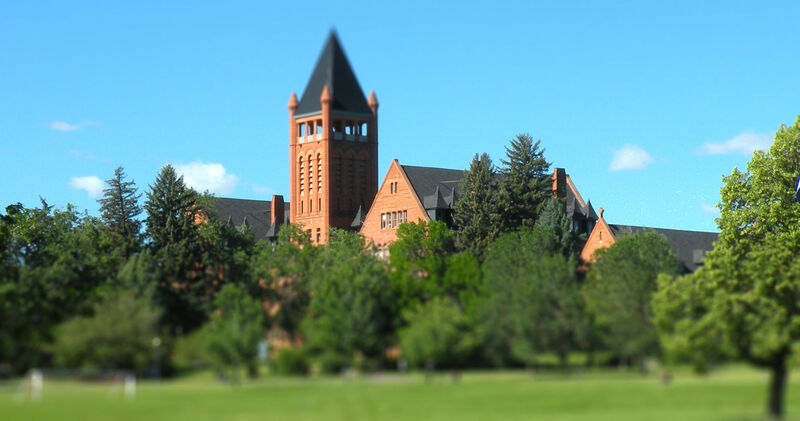 The councilman recently secured southwest Denver’s first-ever neighborhood plan that will gather significant public input into the future of the landmark Loretto Heights campus. Last year, Flynn commissioned a study by the Urban Land Institute on potential revitalization of the aging commercial area on South Sheridan Boulevard, an effort that involved nearly three dozen community partners. On the City Council, Kevin has established a record of independence in evaluating all of the issues. He is chair of the Finance and Governance Committee, and studies all of the contacts that come forward. Twice, he sponsored bills to strengthen the city’s ethics and financial disclosure laws for public officials. Kevin has lived in the southwest area since moving to Colorado 37 years ago to become the City Hall reporter for the now-closed Rocky Mountain News. He worked for the newspaper until the day it closed, and later was the communications manager for the Regional Transportation District’s $2.2 billion commuter rail project. “I am humbled by the broad range of support I’ve received from across the diverse southwest Denver community,” Kevin said. “We have worked with everyone who has stepped up to strengthen and improve the quality of life here in our corner of this great city. Councilman Flynn and Denver’s Community Planning and Development office will lead a community-based comprehensive plan process for the 72-acre Loretto Heights campus that will set a vision for the iconic southwest Denver site, now that is has been acquired by a Denver-based developer. The aim is to develop what will be the first neighborhood-level plan ever done in Council District 2 and serve as the benchmark for an anticipated rezoning application by the developer, Westside Investment Partners. Without an approved city plan, there is no formal community-based guidance by which to evaluate a rezoning. Westside bought the campus in July. In several meetings with neighborhood organizations set up by the councilman, Westside has said it wants a rezoning in order to create a sense of place with “heart and soul” that will animate the historic campus with tenants, users and residents. “The goal is to function as a common place, and encourage meetings and encounters between groups of people,” Westside partner Mark Witkiewicz told Councilman Flynn. His most recent project was Dairy Block in lower downtown. One of the councilman’s chief aims is to preserve the nearly 1,000-seat May Bonfils Stanton Theater, which can be a cultural jewel of the southwest metro area if an operator can be found to take it over. 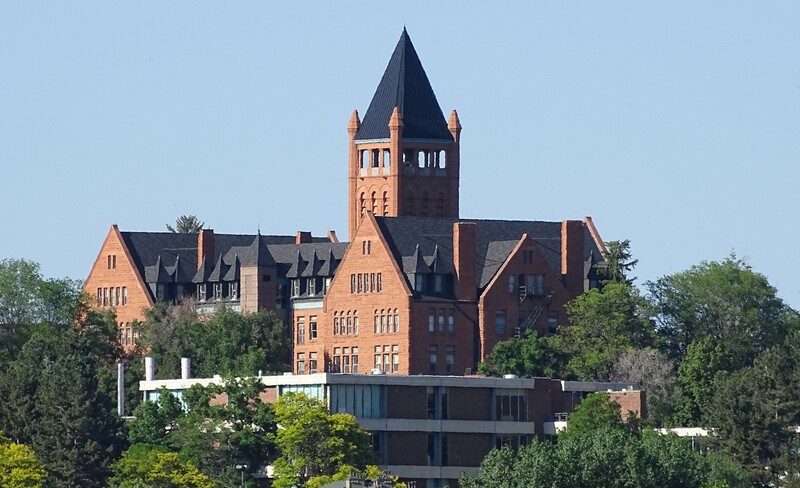 “But first, I want everyone to know that preservation of the Loretto Academy building and chapel is guaranteed,” Councilman Flynn said of the landmark sandstone tower building that dominates the site. A deed covenant requires this preservation. 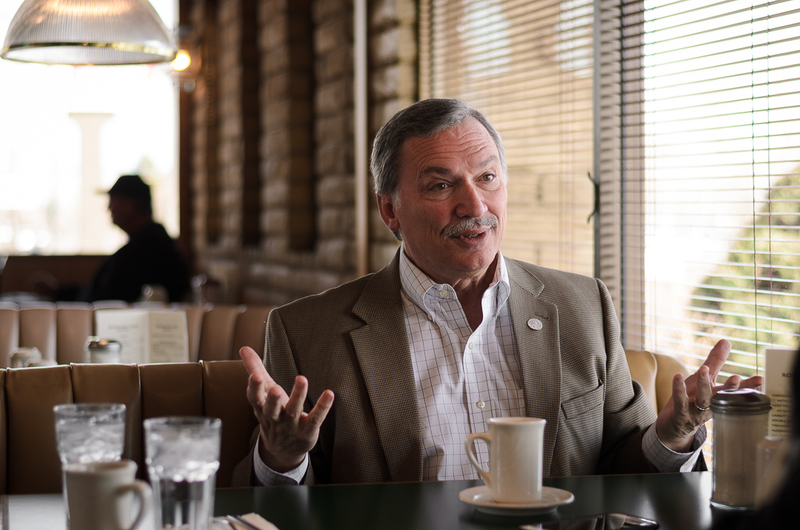 The stakeholder committee organized by Councilman Flynn in January 2017, after Colorado Heights University announced it was closing and selling the campus, will form the nucleus of a new steering committee that will provide the core community input to the plan. It includes representatives from nearby Registered Neighborhood Organizations, elected officials, the Sisters of Loretto, who established the campus in 1890 and sold it in 1988, and Loretto alumni. But, the councilman said, the steering committee will be expanded to include other interests such as non-profit organizations that serve the community, advocates of affordable housing, transportation, social equity and health, property owners and businesses. The time it takes for police to respond to high-priority 911 calls in southwest Denver continues to improve, meeting a key goal that Councilman Flynn set three years ago on taking office. Now, the statistics show that through June, the average response time is under 12 minutes, an improvement of just over 25 percent in three years. In 2015, Councilman Flynn worked with the administration and the police department to set an annual goal of 100 police recruits per year through 2019. This more than offsets retirements and other departures while providing more officers to southwest Denver and the rest of the city. The commercial area on South Sheridan Boulevard between Jewell and Warren Avenue can be revitalized by focusing on health, fitness, local food entrepreneurs and a public gathering place, says a report by the Urban Land Institute commissioned by Councilman Flynn. The ULI’s Colorado Chapter conducted what it calls a Technical Advisory Panel in December, underwritten by the councilman’s office and a grant from the Denver Regional Council of Governments. Five outside experts in land use, retail, transportation and housing interviewed 32 neighborhood leaders, faith and nonprofit leaders, property and business owners, planners and developers. The final report was issued at the end of February. You can read it at tinyurl.com/ULI-South-Sheridan. Among its recommendations: Make Harvey Place, next to Rosemary Café, a festival street where public gatherings such as a farmer’s market or other events can take place; lay out a traditional street grid through the site; focus on health and wellness businesses to capitalize on the presence of VASA, Rebel Farm and the Denver Sports Center; establish a kitchen incubator that can help launch local chefs into business, and rezone parts of the site to allow housing in mixed-use projects. The ULI study grew out of the South Sheridan Steering Committee, a group of residents from Harvey Park and nearby neighborhoods organized in June 2016 by Councilman Flynn to come up with a community vision for revitalizing the South Sheridan commercial area. It used to be home to a diverse collection of businesses including Hugh M. Woods home improvement store, Target, Safeway, a bowling alley, movie theater, a garden store and other amenities. The steering committee has held a series of learning sessions with city planning officials, the Denver Urban Renewal Authority, and a number of retail developers including the developer of Lakewood’s Belmar. 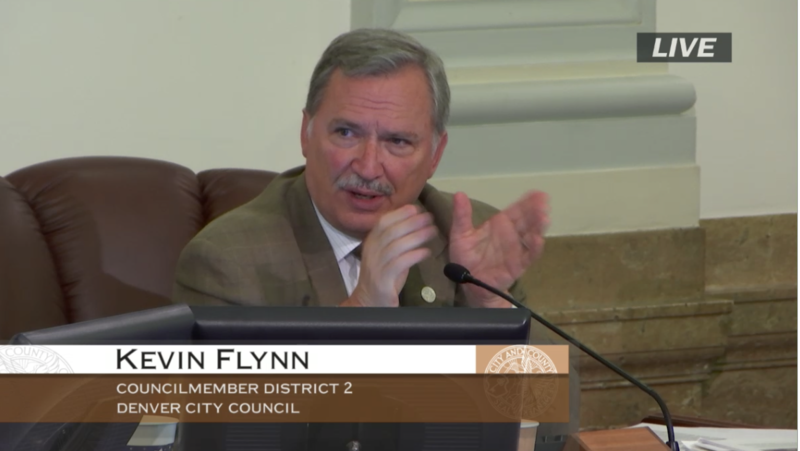 Councilman Flynn’s 2017 budget ended the year with a $54,713 surplus, which he applied to several southwest Denver capital and operating needs to keep the funds working for the people of the district. The largest transfer was $23,413 to Denver Police District 4 for the purchase of tactical equipment including shields. Others include $10,000 to the Parks Department for restoration of the outdoor fitness equipment in Bear Valley Park along Dartmouth Avenue, which will be updated in a project next year; $4,000 to the Denver Municipal Band to defray its expenses when the musicians perform at least four concerts each year in District 2 parks; $3,000 each to Harvey Park and Southwest Recreation Centers for purchase of new equipment; $3,000 to the Bear Valley Cop Shop to provide the public with steering wheel clubs and trigger locks on request; and $8,300 to the District 2 Special Revenue Fund, which is reserved for future capital and other purposes in the district. 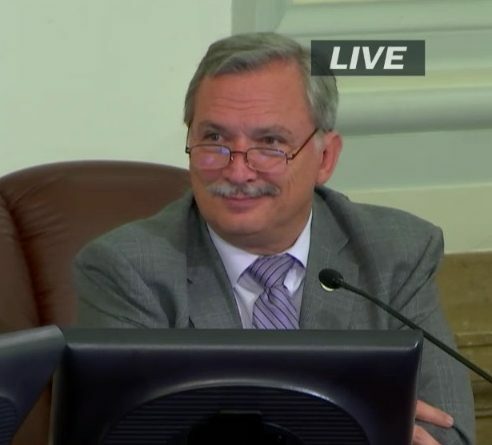 The first telephone town hall ever conducted by a Denver City Council member gave a platform to Council District 2 to have questions answered directly by Councilman Flynn and Denver Police District 4 Commander Mark Fleecs. What did participants want to know? Primarily, how can we slow down speeders in the neighborhoods, and what is the future of the Loretto Heights campus. You can listen online to the entire hour at tinyurl.com/Flynn-Town-Hall. Councilman Flynn held the town hall on Nov. 30 with 103 participants on the line. Calls were made to publicly available land lines in the district, as the law doesn’t allow unsolicited calls to mobile phones. For future town halls, you can opt in for your mobile phone by texting CD2 to 828282. The councilman gave a four-minute update including improved police response in southwest Denver, the sale of the Loretto Heights campus and a study on potential revitalization of the commercial area on South Sheridan Boulevard between Jewell and Warren avenues. Cmdr. Fleecs talked about crime in the district, focusing on prevention of auto theft and theft from motor vehicles. 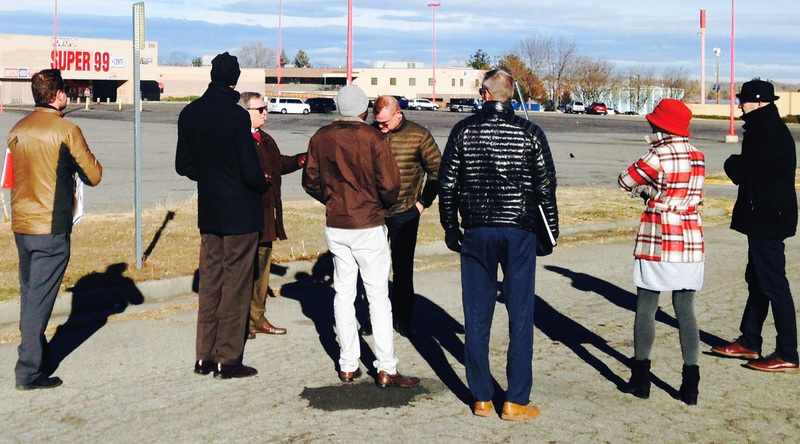 Councilman Flynn has engaged the Urban Land Institute – Colorado Chapter to conduct an intensive review of the commercial area along South Sheridan between Jewell and Warren avenues. Professionals in the fields of real estate, development, finance, transportation and marketing will study the 64-acre area that used to host a Target store and other businesses, but which has declined in commercial traffic in recent years. Called a Technical Advisory Panel, the program brings in experts from outside Denver who bring fresh eyes to the challenges and opportunities that may lead to revitalization. The two-day exercise will take place in early December. The councilman won a $5,000 grant from the Denver Regional Council of Governments to cover one-third of the cost, and will use his office budget to pay for the rest. The ULI panel will conduct interviews with neighborhood leaders, property owners, business owners and others, along with studying data on the regional market, demographics, traffic and transit, walkability and other factors. Target closed the store at Evans and Sheridan when it opened its new store in Lakewood’s Belmar in 2011. It sold the building to a discount retailer with a deed restriction limiting direct competition for 20 years. The area is home to many successful businesses and restaurants, and the former Safeway market at Jewell is being renovated as a fitness center, all of which are a foundation for revitalization. But other parcels are vacant or underused. The ULI panel will come up with a recommendation for future uses to rejuvenate the neighborhood. Thirty residents of the Harvey Park area attended the Colorado Symphony performance of George Gershwin’s “Rhapsody in Blue” in Boettcher Concert Hall on Sept. 24 with Councilman Flynn and his wife to celebrate Harvey Park’s link to a famous event in American musical history. The groundbreaking American jazz concerto premiered in New York in 1924, performed by the world-renown orchestra of Denver native Paul Whiteman, who commissioned Gershwin to compose it. That same year, Whiteman purchased the ranch that is much of what is now Harvey Park as a retirement gift for his father. Councilman Flynn put together a block of seats for the afternoon performance, which included Tchaikovsky’s Symphony No. 5 and Missy Mazzolli’s These Worlds In Us. Symphony staff offered a backstage tour for the group beforehand. The first section of Harvey Park, between Jewell, Lowell, Yale and Sheridan, was once the Black and White Ranch owned by Whiteman, a North High School graduate who was famous as the Jazz King of America in the 1920s. He built the house at Tennyson and Iliff for his parents. Texas oilman Arthur Harvey bought the ranch in 1948, and six years later annexed it to Denver from Arapahoe County to become the residential neighborhood we know today. Harvey died in 1976 and is buried in Fort Logan National Cemetery. The city council voted 10-3 to approve a five-year contract with Superfly Presents that allows the promoter to stage an annual three-day music festival starting next September on Overland Golf Course. The contract allows the course to be closed for at least five weeks to allow set-up and tear-down. I was one of the three votes against it, along with council members Paul Kashmann and Debbie Ortega. I concluded that Overland Golf Course is not a suitable location for a gathering of up to 80,000 people per day, all of whom must enter and exit each morning and evening. The transportation plan had not yet been developed, and the neighbors in the tiny Breenlow Park subdivision between Jewell and Evans avenues, who will be most affected by this enormous event, were mostly against it. Moreover, just a few years ago the parks department adopted a policy governing festivals and admission-based private events in city parks. With citizen input, it designated seven parks for festivals, none of them a golf course, and stated that admission-based private events would not be conducted on golf courses. I believe it breaks faith with the public to establish a policy only to waive it when this proposal came to us. Councilman Flynn’s office has fostered the formation of three new Denver Registered Neighborhood Organizations and expansion of one existing RNO, to give residents more voice in city business. Most District 2 neighborhoods weren’t covered by RNOs registered with the city, which left them out of participation in such things as rezonings, liquor licenses and marijuana store licenses. The council office plans to foster more new ones in 2018. RNOs are not the same as a homeowners association, or HOA. An RNO is a city-recognized organization entitled to participate in hearings and other procedures. When a rezoning, or a liquor or marijuana license is pending, RNOs may take official positions, negotiate Good Neighbor Agreements and other actions. RNOs also receive regular information on city news and events. The first new RNO is the Seven Springs Community. Located along the south side of Bear Creek, between Newland and Ivan streets and the Hamden Freeway frontage road, Seven Springs consists of 118 single-family houses. The second new RNO is Glenbrook-Park West-Village West Neighbors. Located between Kipling and Dudley streets, and Belleview and Stanford avenues, the neighborhood is at the farthest southwestern point in the City and County of Denver. The council office leafletted 1,500 homes for the organizational meeting. The third new RNO is the largest of the three, South Mar Lee-Brentwood-Sharon Park Neighbors. More than 4,400 homes were leafletted for the initial meeting in July, and 70 people attended. Brentwood and Mar Lee were the first parts of what is now Council District 2 to be annexed into Denver from Arapahoe County, in 1944 and 1946. As our oldest neighborhoods, it is crucial that they be represented by a vigorous new RNO. Combining them with Sharon Park abutting the Loretto Heights campus gives these residents a strong voice in any future rezoning there and along Federal Boulevard. Finally, the Green Meadows Improvement Association, between Harlan and Depew streets and Warren and Evans avenues, expanded its boundaries eastward to Sheridan and north to Jewell to encompass the commercial parcels along Sheridan. That gives Green Meadows standing to participate in things that happen on its doorstep. 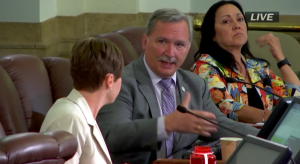 City Council adopted my amendments to the Denver Code of Ethics that, for the first time, impose a cap on the dollar value of meals or event tickets city employees, officers and officials may accept from people who do business with the city. One of the changes places a $300 annual limit on tickets or admissions to events. The code previously allowed city workers and officials to accept up to four such items regardless of their value. The amendments also add to the range of relatives included in “family members” who also are included in various gift prohibitions, and sets up a nominating committee to recruit candidates for the ethics board instead of having the mayor and council recruit the members. This is the first substantial change to the ethics code since 2001 when, after 18 months of contentious debates and three competing proposals, the council adopted a limit on meals and tickets. I covered that controversy back when I was city hall reporter at the Rocky Mountain News, and that gave me valuable background while pushing for these amendments. It is not sufficient that public officials go to bed each night believing they’ve acted ethically. The people of Denver need to believe it as well. 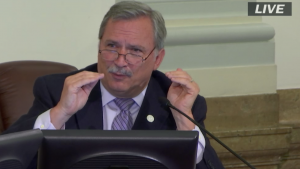 The changes I sponsored were requested by a task force that included members of the Denver Board of Ethics and outside stakeholders including the League of Women Voters and Colorado Common Cause. I served on the task force last year. Denver’s code appeared to be the only one in the country that limited tickets and events by the number that could be accepted, rather than the dollar value. Most cities, counties and states that have restrictions use a dollar cap. One event ticket alone could have a value of $300 or more. The city council voted recently to dedicate a half-mill of the property tax levy to a permanent affordable housing fund. I had significant concern with the original proposal to take that half mill from the reserve that voters authorized in the 2012 TABOR referendum. That was Referendum 2A, and it allowed the city to increase the mill levy up to the lawful ceiling for “essential city services” such as police hiring, accelerated street repaving, restored parks maintenance and other specific purposes listed on the ballot. I could not have voted for the housing fund if it were to come from the 2A authorization, because I believed the voters did not authorize the provision of affordable housing as an essential municipal service. I went to work with the council sponsors of the bill and succeeded in crafting an amendment, which passed unanimously, that dedicates the half mill instead from the TABOR-restricted portion of the mill levy. What my amendment did was preserve the future use of the additional property tax levies you authorized in 2012 for the more specific purposes that were listed on the ballot. That means in another recession, we will have the reserves available so that we do not have to go five years without hiring a single new police officer to replace retirees, as happened in the last recession. Teikyo University Group’s decision to close Colorado Heights University’s campus at Loretto Heights creates an uncertain future for the 60 acre-plus site. The prominent hilltop campus has been an educational haven for a century and a quarter. It is arguably the most visible landmark in southwest Denver. So the new year is going to present us with a new challenge – a vacancy at the site of one of our major institutions. Loretto Heights’ campus is on the west side of Federal Boulevard at Dartmouth Avenue. The day the college leadership made the announcement that it would cease operations by next fall, I was in touch with the mayor’s office and the mayor’s executive director of community planning and development. In addition, I contacted the leaders of the Registered Neighborhood Organizations and the homeowner associations in the surrounding area that are not registered with the city, to organize a community-based committee oriented toward forming a neighborhood vision and consensus for the future of the Loretto Heights area. In coordination with Councilman Jolon Clark from the east side of Federal Boulevard, I have invited the following groups to send a representative to a meeting I will organize in January: Loretto Heights Neighborhood Association, Dartmouth Heights Homeowners Association, Harvey Park Improvement Association, College View Neighborhood Association, Ruby Hill-Godsman Neighborhood Association, Bear Valley Improvement Association, Greater Mar-Lee Community Organization and Pinecrest Village Improvement Association. I am also inviting stakeholders from Sharon Park and Brentwood. The group will also be a sounding board for any proposals that emerge in response to the sudden opportunity to repurpose the campus. 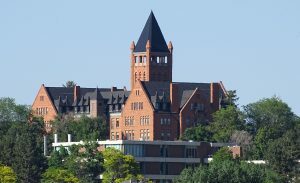 The campus includes the beautiful, iconic and historic landmark Loretto Heights Academy building. The architect was the renown Frank E. Edbrooke, the architect of the Brown Palace Hotel, downtown’s Masonic Building, Denver Dry Goods and the old Joslin’s building, all on the 16th Street Mall, the Oxford Hotel, Central Presbyterian Church, and so many other magnificent buildings of late 19th and early 20th century Denver. 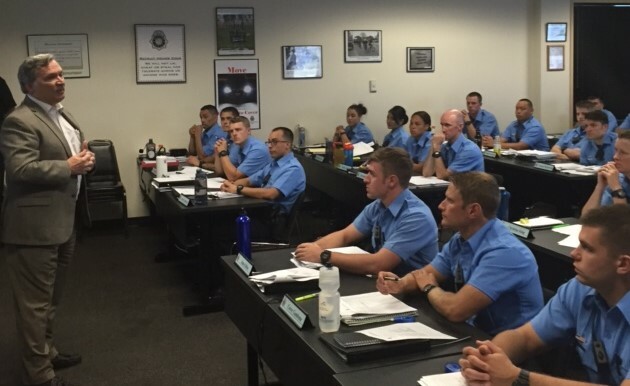 Denver is hiring 41 additional police officers this year as a result of my work to increase public safety. Rather than hiring 44 new officers this year, as first outlined in the 2016 budget last fall, I worked with Police Chief Robert White to put 85 recruits into our police academy. But it won’t stop there. Mayor Michael Hancock asked Chief White to work with me and other parties on a staffing analysis, which later recommended that the authorized strength of the Denver Police Department be ramped up to 1,570 by 2019. That is an increase of 150 over the number of officers we had on the street at the end of 2015. One of Chief White’s strategic goals is to have officers spend 35 percent of their time in pro-active community policing – initiating contacts and meeting the people. Right now, too much of an officer’s day is spent going from call to call – reactive policing. We can and will do better. The staffing analysis quantified the number of officers needed to achieve that goal. While the number will be re-evaluated every year, I won a commitment from the rest of the City Council to fully support the added hiring to get us to the new authorized strength. Building up the uniformed strength of the DPD was my first objective after taking office in July. Crime was up citywide 8.2 percent in 2015, with property crime up 7.3 percent and violent crime up 13.4 percent. However, in Council District 2, the numbers are more troubling. The overall crime rate was up 12.3 percent last year. Property crime increased 11.2 percent and violent crime was up nearly 20 percent. It will take time for the new hires come on board and show results. So I ask you to continue taking part in preventing and solving crime by calling police when you see something that ought to be reported. In our data-driven world, more police resources are allocated to areas where more calls for service originate. The city administration has asked the council to approve an increase to the annual stormwater fee. That’s the bill that property owners pay each year to pay for the construction and maintenance of storm drainage facilities such as gutters, inlets, underground pipes, detention basins and other improvements that carry runoff from rain storms and snowmelt. I voted against the increase in the council’s Infrastructure Committee and, if not changes are made in the proposal, I plan to vote against it when it comes to the full council on final reading June 6. Here’s why. The proposal would raise the fee by 10 to 11 percent each year over five years, for a cumulative increase of 66 percent. Part of the increase is directed at repayment of $206 million in new bond financing to provide the bulk of funding for a large drainage project in northeast and east Denver’s Park Hill and Montclair neighborhoods. This project has grown like kudzu from a $134 million agreement last year with the Colorado Department of Transportation to share costs of drainage protection for CDOT’s Interstate 70 viaduct replacement with a below-grade roadway. Approved last year before I was sworn in, the agreement had CDOT paying 40 percent of that cost and the city 60 percent. 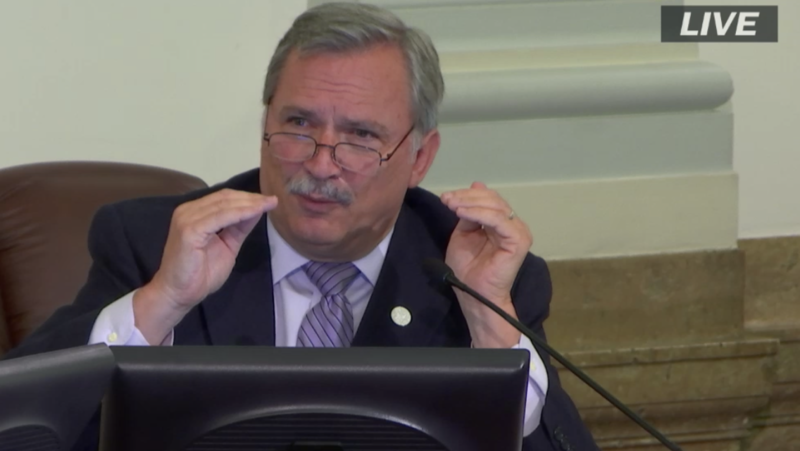 Afterward, the city’s wastewater division saw an opportunity to take advantage of this shared funding, and expanded the plan to build improvements farther up the drainage basin to eliminate chronic flooding in Park Hill and Montclair. I have personally witnessed this flood phenomenon over my years of involvement. However, the estimated cost of the project has now grown from $134 million to as much as $298 million – with no guarantee that’s the limit. It now includes a plan to close City Park Golf Course for two years, remove a minimum of 100-plus trees and construct a detention basin in the northwest corner of the course. I cannot support a fee that authorizes a project that has added so much cost in so little time with so little definition. I asked the administration to consider sticking just to the $134 million scope that was promised to CDOT.